Sterling silver, Turquoise, Mother of Pearl, Oyster Shell, and Black Jade. The link bracelet measures approximately 7-1/4" inside circumference, which means the bracelet will fit a wrist that is 6-1/4" to 7" comfortably. Each link measures approximately 3/8" long (excluding side rings) and 1/4" at widest point. There is nothing at all average about this stunning bracelet! 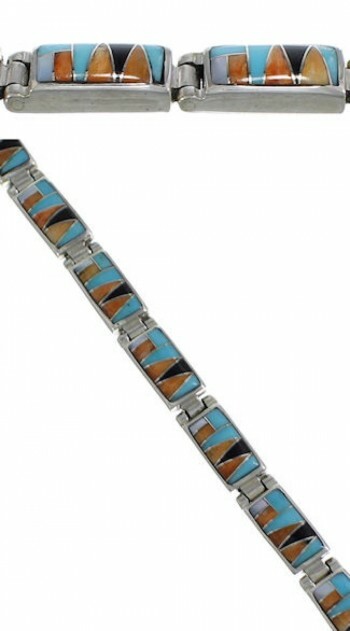 This bracelet is a gorgeous piece of jewelry that is hand crafted out of genuine sterling silver and Multicolor inlay. The inlay consists of: real Turquoise, Mother of Pearl, Oyster Shell, and Black Jade. The inlay is gently set into FOURTEEN lovely links, while thin silver lines can be seen in between adding style. The bracelet is complete with a silver box clasp. The bracelet is stamped sterling.